Members of the public have been urged to stay away from a Lincolnshire seal colony after a tidal wave separated seal pups from their mothers. Staff at Donna Nook, one of the largest grey seal reserves in the UK, said they wanted to avoid causing the animals further distress. They said it would then allow the animals a chance to find each other. There were also public safety concerns as many of the seals had gone through a broken fence into the viewing area. Rachel Shaw, from the trust, said: "We need to give the seals time away from people - we are concerned that there will be pups that have been abandoned just because their mothers can't find them again." 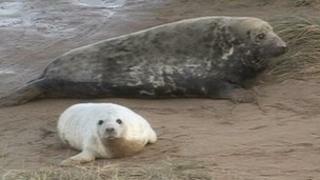 More than 1,000 seal pups have been born at Donna Nook this year. Mrs Shaw said wardens at the reserve were reviewing the situation and doing a seal count on Tuesday to establish if any pups had been washed out to sea. She also urged anyone visiting that section of the Lincolnshire coast to be aware that there could be seals on the beach or in sand dunes. "These seals have been through something quite distressing and could be quite stressed and people need to avoid approaching them," Mrs Shaw said.